Home Pianos Piano's Tips How Many Keys On A Piano ? Learning how to play the piano can turn out to be very satisfying. It provides you a good way to relax, and eventually do something during your free time. However, a lot of people often deprive themselves of this pastime because they feel that they are simply overwhelmed by the keys they find on a piano. For these people, these keys are a dizzying pattern, and thus assume that they have to be good with learning all eighty-eight keys in order to learn how to play. However, this is just a myth. These keys come with a distinct pattern. Pianos have differing number of keys. Some have 49, 61, 73, and 88 keys. A 49 key piano has four octaves. It is often used for portable pianos and keyboards. While this is not a full piano, it can already mimic the dynamics of an actual piano. This piano is oftentimes referred to as a portable piano workstation. It is often used in digital or electronic keyboards. This is used by those who prefer rock keyboards, rather than classical music. 73-key pianos are often digital in design. It offers a full range of piano notes without being cumbersome and heavy. It is perfect for live performance because they are lightweight, compact and versatile. Classical pianos have 88 keys. Despite being so, it does not mean that there are eighty-eight notes that you need to learn. In fact, there are only twelve notes. The notes just repeat continuously as the player moves along the keyboard. The keyboard has five black keys, with seven white keys. In order to understand the composition of a piano, let us focus on familiarizing the 88-key piano. A piano is composed of a series of white and black keys. On an actual piano, there are generally 7 octaves, corresponding 75 keys. On the other hand, if you take into consideration a keyboard or an electronic piano, the number of keys vary depending on the instrument size. Every key has a note name. Therefore, as you press a specific key, the air vibrates at a particular frequency, thus producing a unique sound. There are two groups of black keys – batch composed of three keys, and another of two. These groups are being repeated for the complete keyboard length. (Pattern of 2-3-2-3 and so on). In the world of music, the notes come with names, particularly the first seven alphabet letters – A,B,C,D,E,F,G. Every white key is provided with these names. They also correspond to the black colored keys. If it is your first time to learn how to play the piano, you will actually discover that each finger are provided with numbers, from 1 to 5, with the thumb corresponding number 1. As you read, and eventually play music, you will see little numbers either above or just below the note. They correspond to the number of the actual finger that you need to place on the key in order to make sure that it stays consistent every time you play, helping with playing with ease. At times, song composers write finger numbers. This can help you a lot if you are still starting to learn how to play a piano. Familiarizing the names of the keys on a piano is very important. Most expert pianists recommend resisting the urge to write the name of the keys on the actual piano using a marker pen. By doing so, you will realize that learning is far better eventually. In the eyes of the beginners, the piano keyboard seems to look like a sea filled with white and black. The way in which most piano teachers deal with this problem is to show first and foremost, where the middle C is. This should be the very first thing that newbies have to learn. Rather than using an actual pen for a marker, anyone who wants to learn how to play the piano should create a visual marker in their heads, making the piano keyboard easier to see. This is done by forming chords. Sure enough, you may end up spending all of your time learning all notes on the piano. Still, you will find yourself confused, not knowing how to create music. However, if you can learn an approach that is chord based initially, you will be able to see the piano keys in the form of chords rather than seeing them as individual notes. The moment this happens, you will no longer feel confused. You can start with an open position chord. This will give you a simple understanding to keyboard harmony. 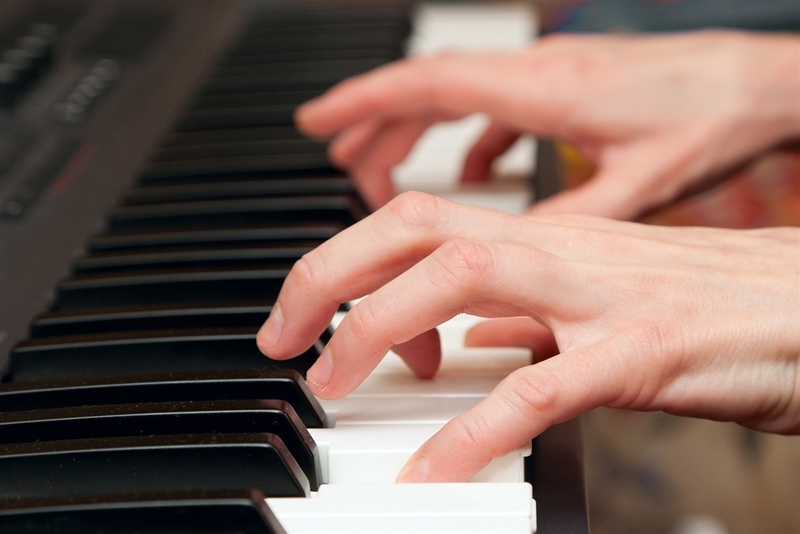 Both of your hands are used as you play something referred to as a seventh chord. These seventh chords are utilized by contemporary pianists in order to create a so-called ‘modern’ sound. It does not really matter which type of keyboard you use, but the best way in which you learn the notes’ names is to look at a part of the keyboard rather than the entire keyboard, because there are only seen note names for the white keys to learn. After learning them, you will eventually learn the names of each of the white notes on your piano keyboard. Finding the answer to the question “how many keys on a piano” can aid you in learning how to play the piano in an effective way!